Rev. John B. Bradac, CSV, died on April 26, 1953 after suffering a heart attack in his residence at the provincial house on Sheridan Ave. in Chicago. All those who knew him were left with an indescribable sense of loss. He was 60. A native of Carlinville, Illinois, Fr. Bradac was ordained in Kansas City, Missouri in 1921 after graduating from St. Mary Seminary in Baltimore. He joined the Clerics of St. Viator in 1923 and taught from 1924 to 1928 at the academy of St. Viator College, Bourbonnais, Illinois. For the next 10 years, he was on the mission band, giving missions throughout the country and then became assistant pastor at St. Viator Church in Chicago. 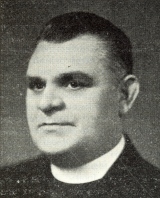 He also served as chaplain at Kankakee State Hospital and at Our Lady of Mercy Hospital in Dyer, Indiana. Fr. Bradac’s last teaching assignment was at St. Gregory High School in Chicago, though it was cut short due to his failing health. Although he could no longer take the strain of the classroom, Fr. Bradac continued one of his favorite practices, of bringing spiritual and material comfort to the outcasts of society, to those “accounted of little importance” living in Chicago’s Skid Row. A wake for Fr. Bradac took place April 29 at Theis Funeral Home until 3 p.m., when the body laid in state in St. Viator Church in Chicago until the funeral. 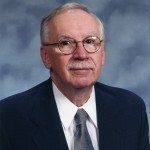 The funeral Mass took place at 10:30 a.m. on April 30. Interment was in the Viatorian plot at Queen of Heaven Cemetery in Hillside, Illinois.